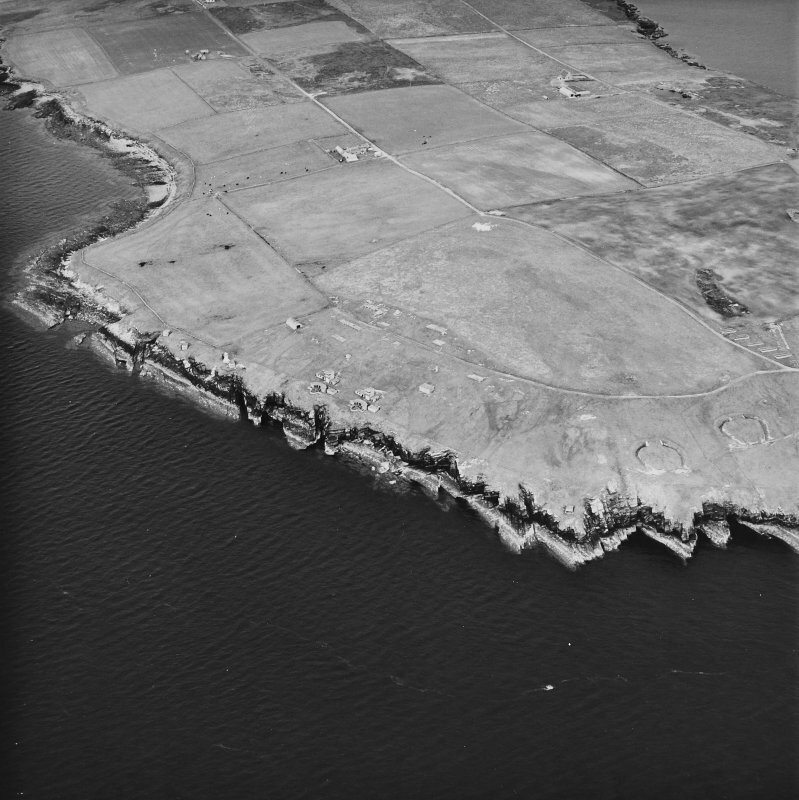 Oblique aerial view, taken from the SW, centred on Hoxa Batteries and Camp Site, and showing Balfour Battery in the top left-hand corner area of the photograph. 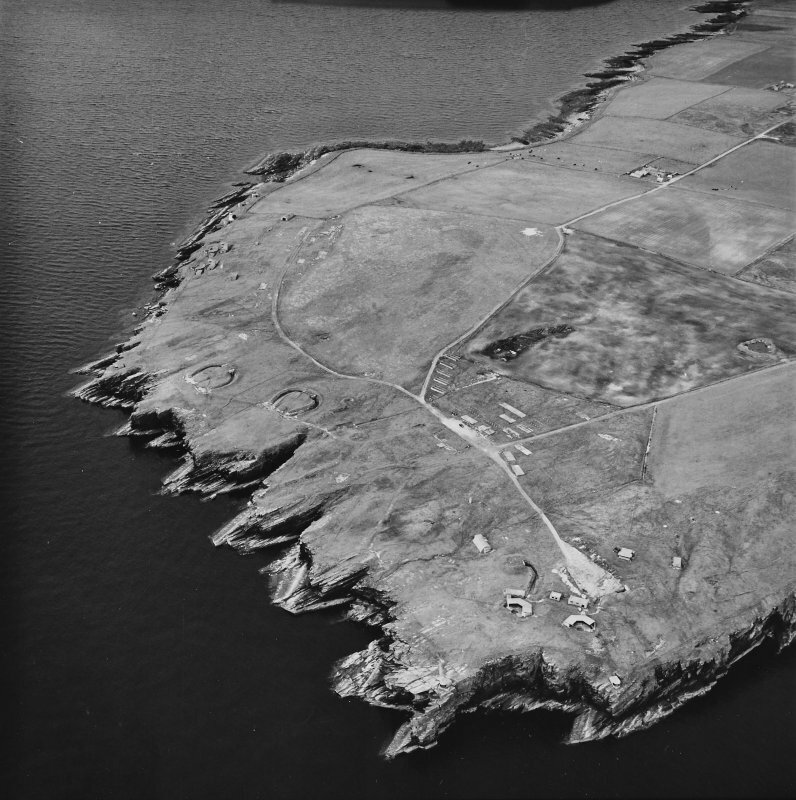 Oblique aerial view, taken from the N, centred on Hoxa Batteries and Military Camp, and Balfour Battery. 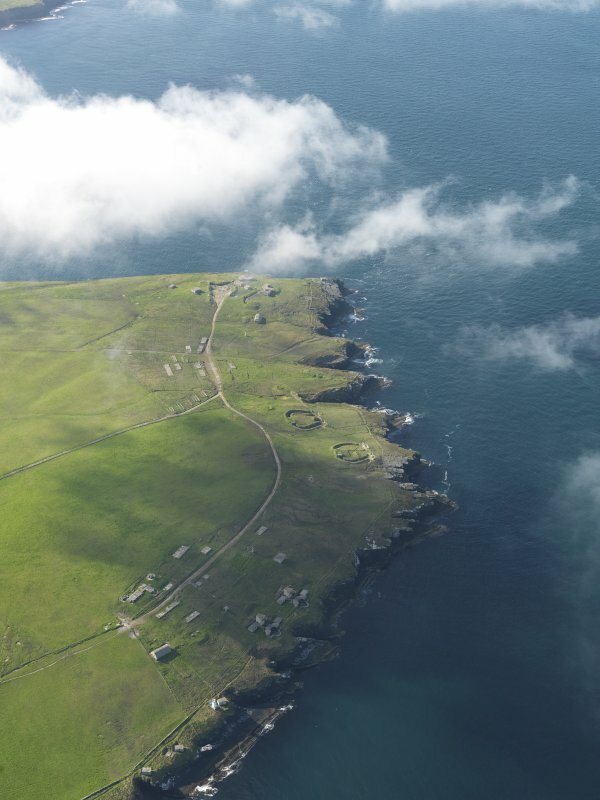 Oblique aerial view, taken from the NNW, centred on Balfour Battery, and showing Hoxa Battery in the background. Scanned image of Battery Observation posts (towers) for W.W.2 twin 6-pounder gun emplacements, view from South East. Light beacon in the background. 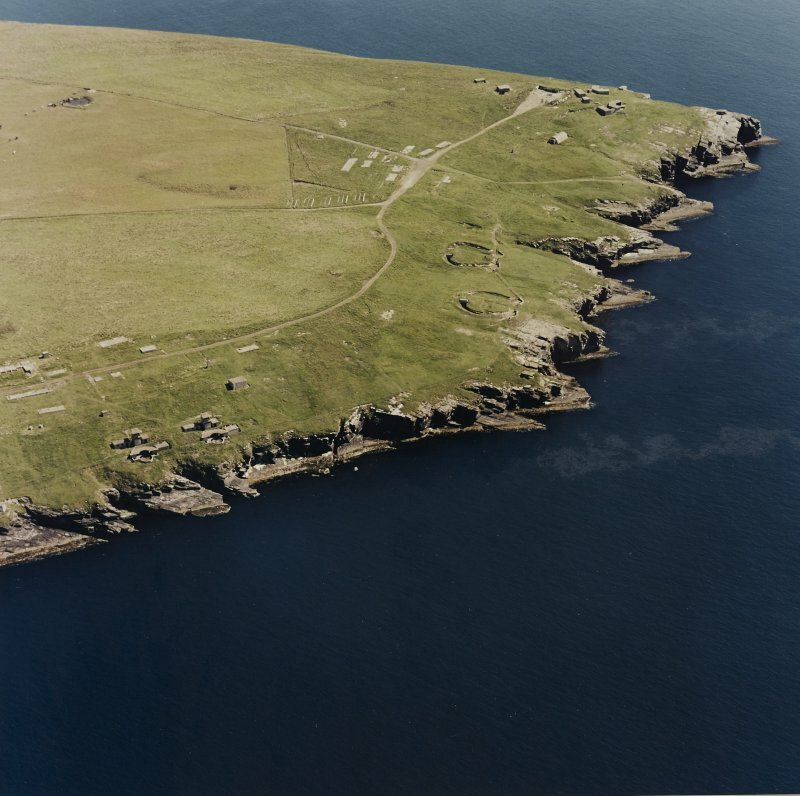 Oblique aerial view of Orkney, South Ronaldsay, Hoxa Head, First and Second World War coastal batteries and the Second World War Balfour Battery taken from the SW. Also visible are the concrete hut bases of the accommodation camp. 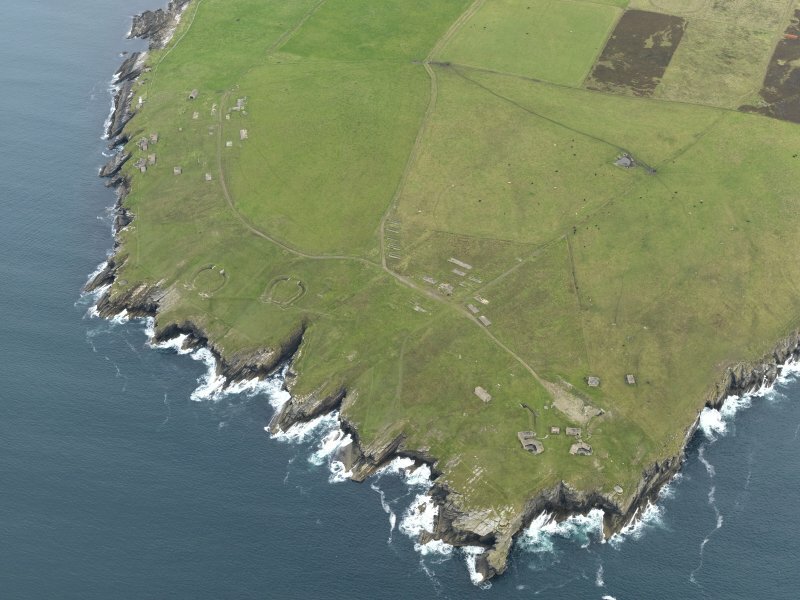 Oblique aerial view, taken from the N, centred on Balfour Battery, and showing Hoxa Battery in the top right-hand corner area of the photograph. 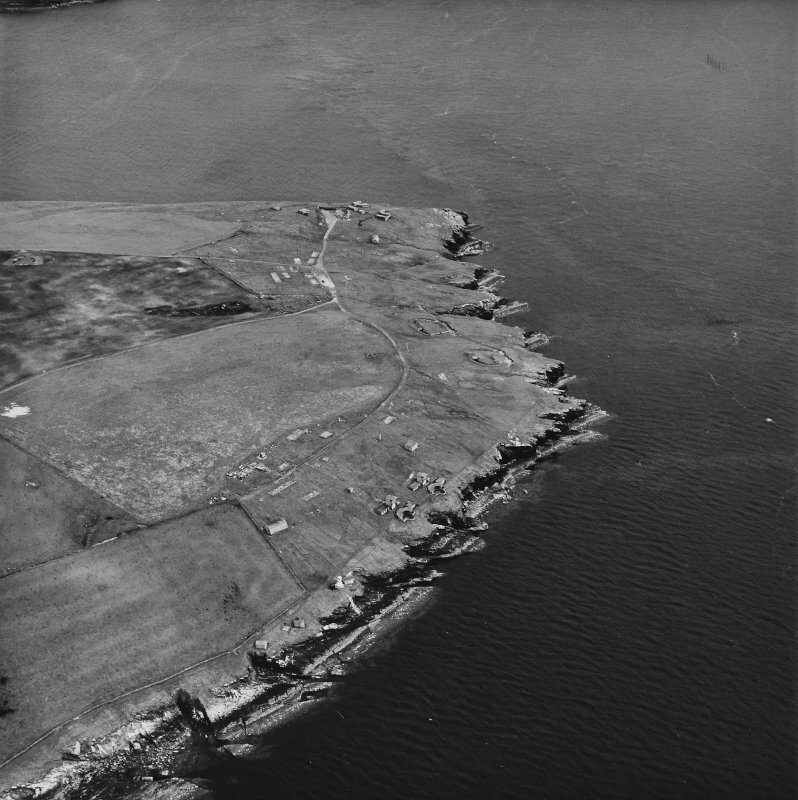 Oblique aerial view, taken from the NW, centred on Balfour Battery, and showing Hoxa Battery in the top right-hand corner of the photograph. 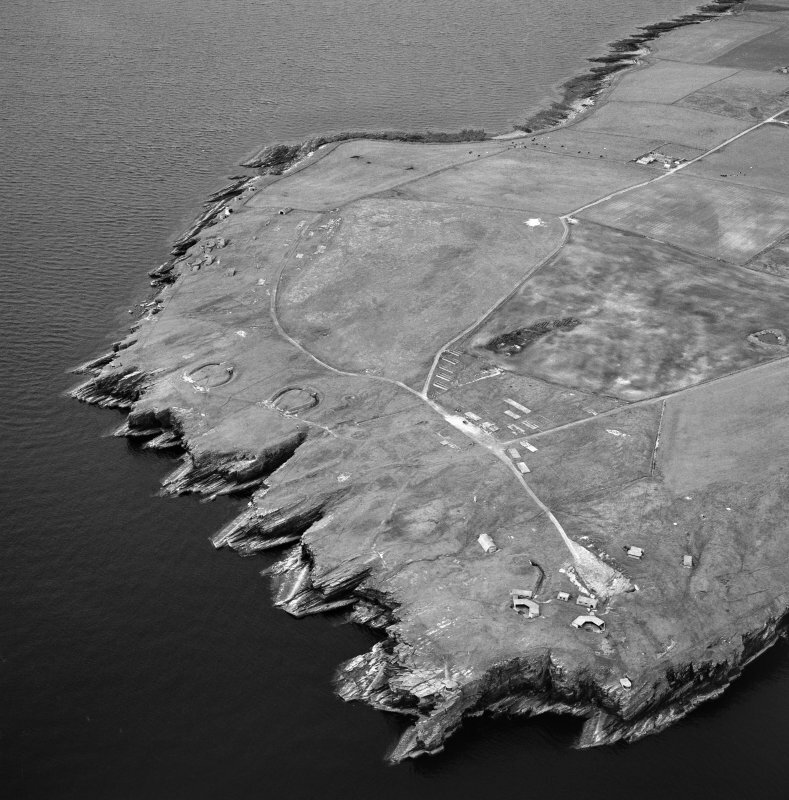 Oblique aerial view, taken from the SSW, centred on Hoxa Batteries and Camp Site, and showing Balfour Battery in the top left-hand corner area of the photograph. 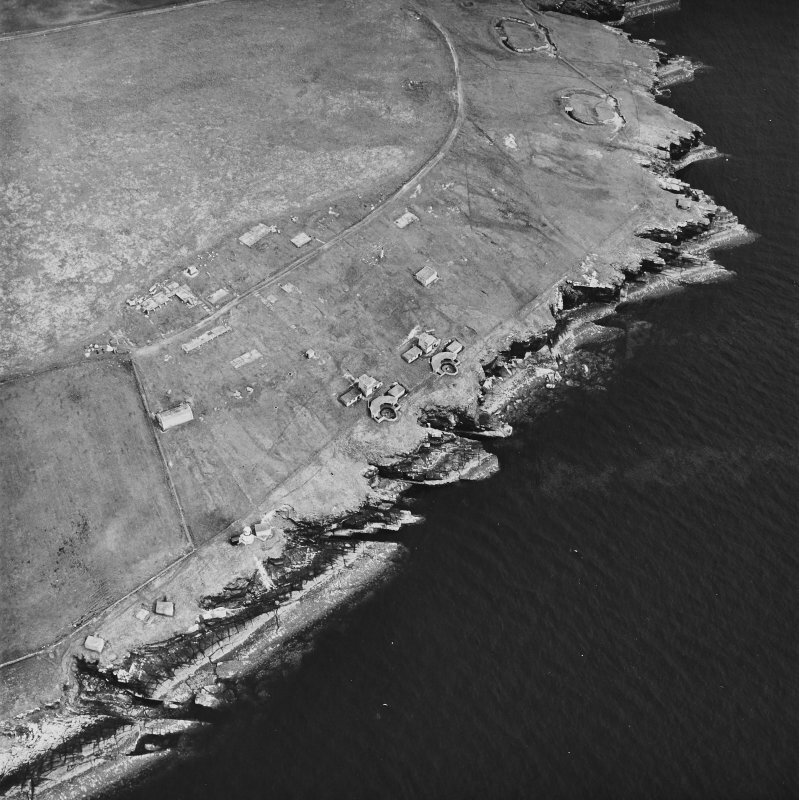 Oblique aerial view, taken from the W, centred on Balfour Battery, and showing Hoxa Battery in the left centre of the photograph. 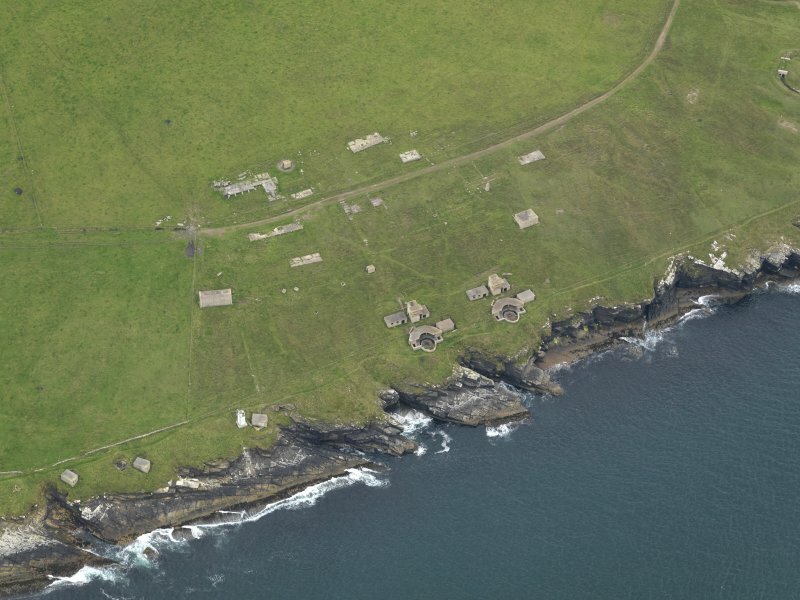 Oblique aerial view of Orkney, South Ronaldsay, Hoxa Head, First World War coastal battery and the Second World War Balfour Battery taken from the SW. Also visible are the concrete hut bases of the accommodation camp. 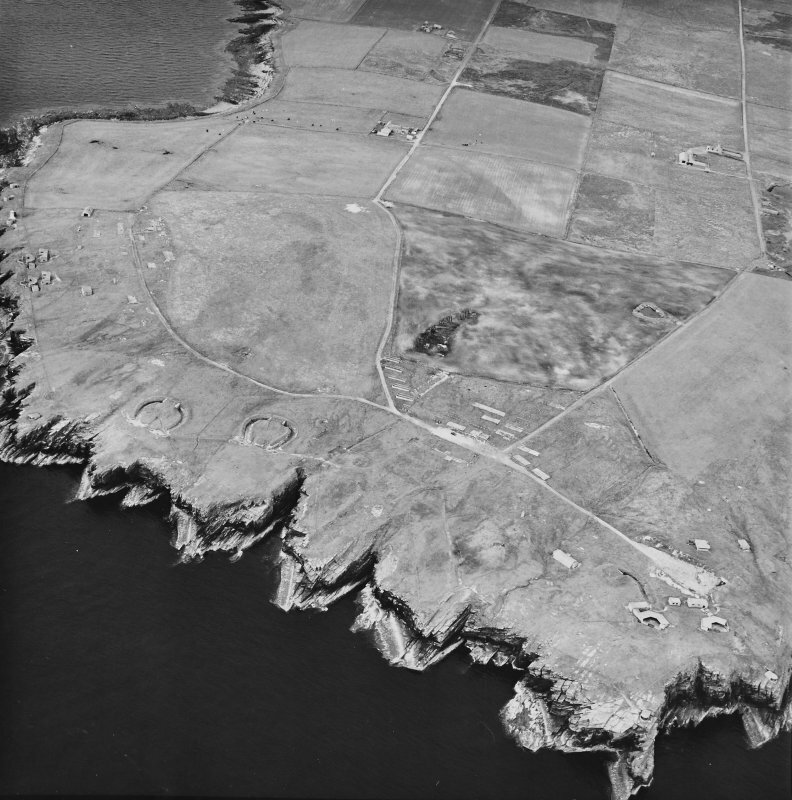 Oblique aerial view, taken from the NE, showing Hoxa Batteries and Camp Site in the centre and left half, and Balfour Battery in the centre right of the photograph. 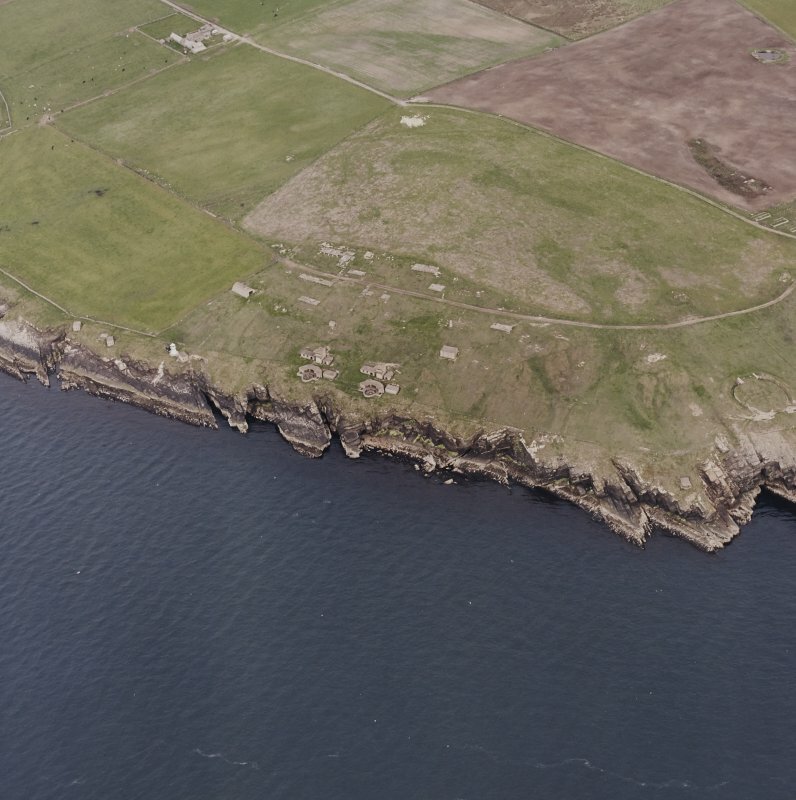 Oblique aerial view centred on the Balfour coastal gun battery, taken from the NW. 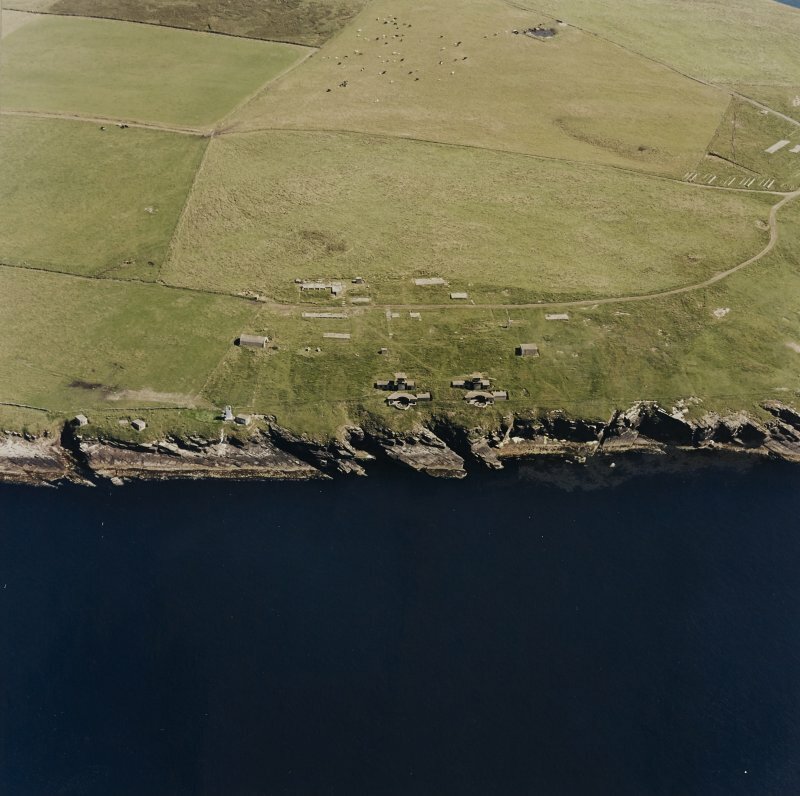 Oblique aerial view of Orkney, South Ronaldsay, Hoxa Head, First and Second World War coastal batteries and the Second World War Balfour Battery taken from the NW. Also visible are the concrete hut bases of the accommodation camp. 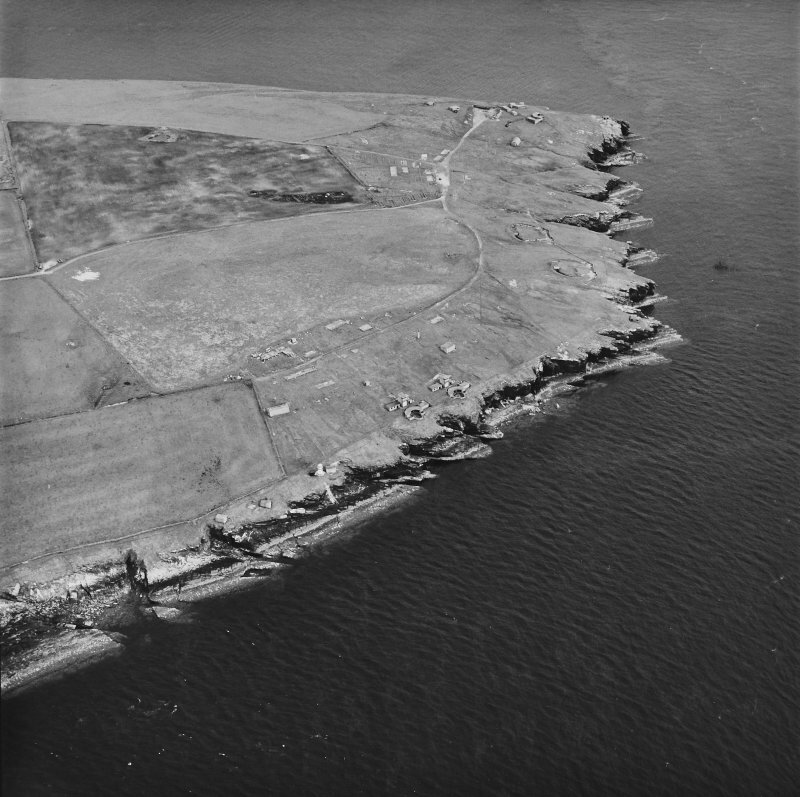 Oblique aerial view of Orkney, South Ronaldsay, Hoxa Head, Balfour Battery and lighthouse, taken from the WSW. 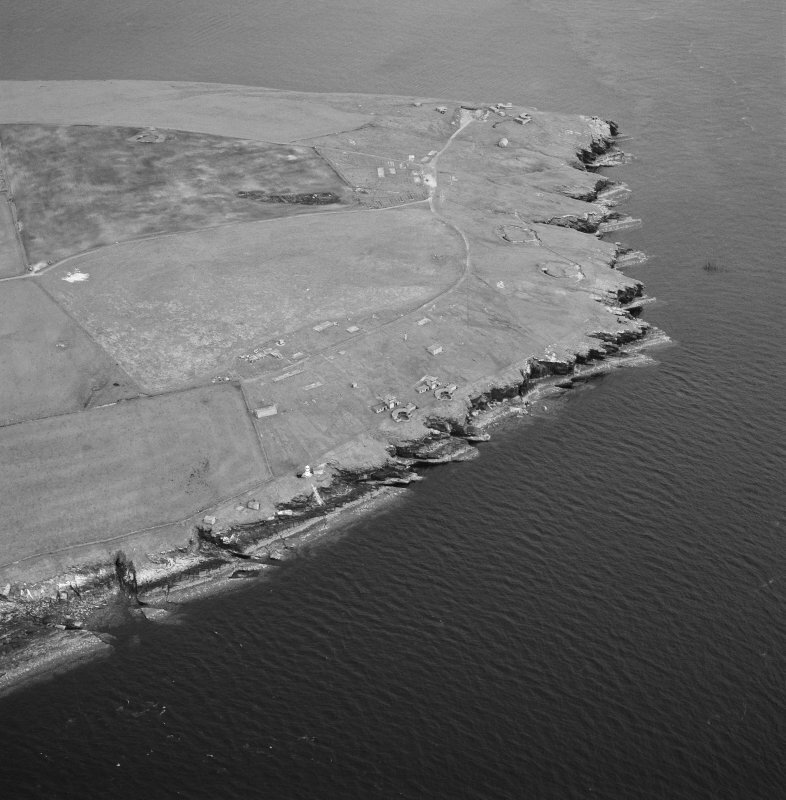 Oblique aerial view, taken from the NW, centred on Balfour Battery, and showing the edge of Hoxa Battery in the centre right of the photograph. 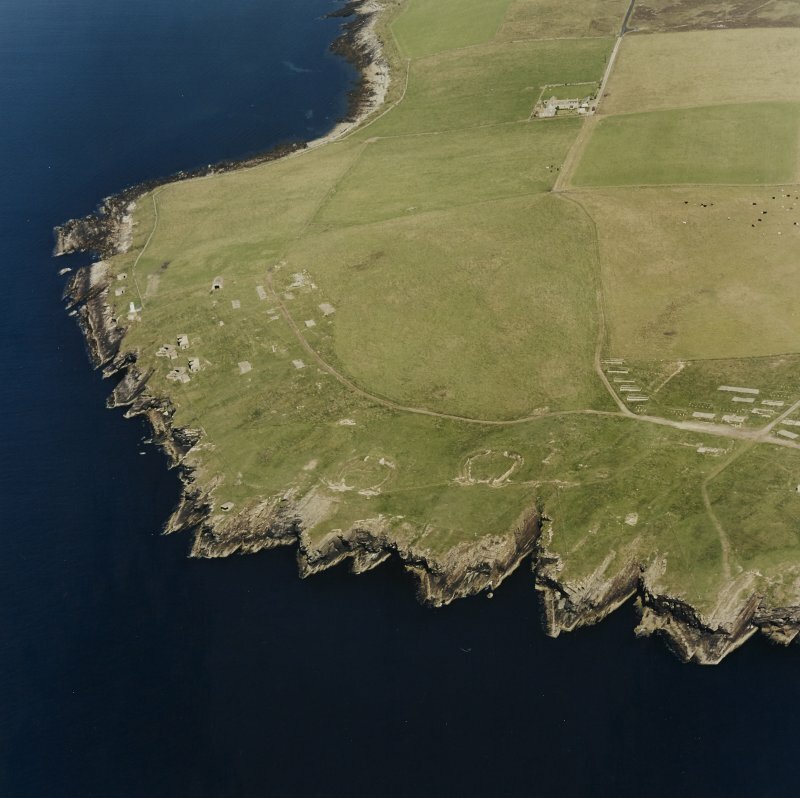 Oblique aerial view, taken from the N, centred on Balfour Battery and Hoxa Battery. Oblique aerial view centred on the Balfour coastal gun battery, taken from the WNW. 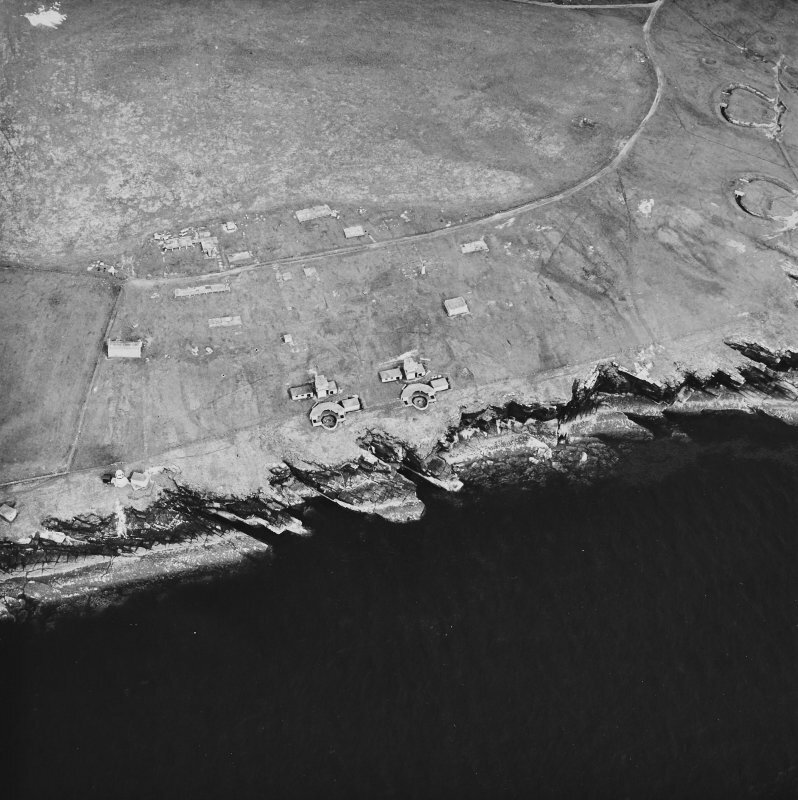 General oblique aerial view centred on the coastal gun batteries, taken from the S.
Oblique aerial view, taken from the NW, centred on Balfour Battery, and showing Hoxa batteries and Military Camp in the top right-hand corner of the photograph. General oblique aerial view centred on the Hoxa Head Battery, taken from the NNW. 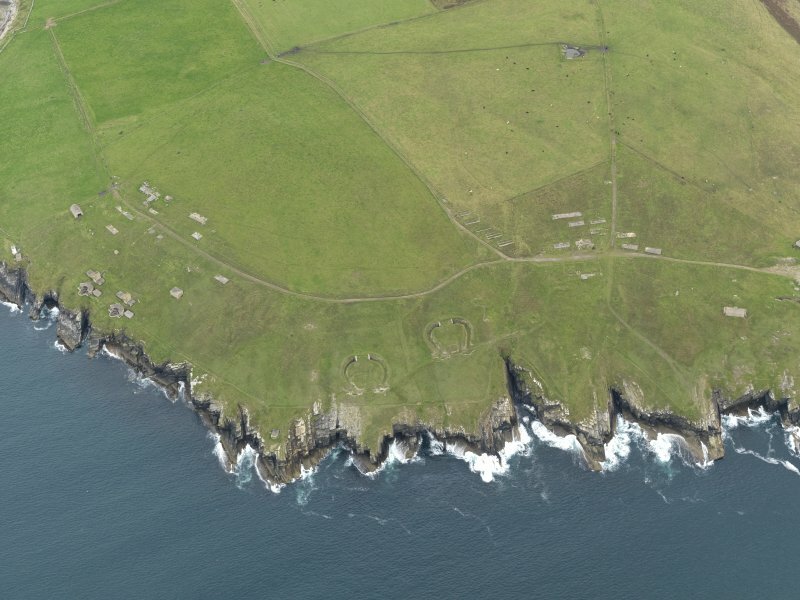 General oblique aerial view centred on the Hoxa Head Battery, taken from the NW. 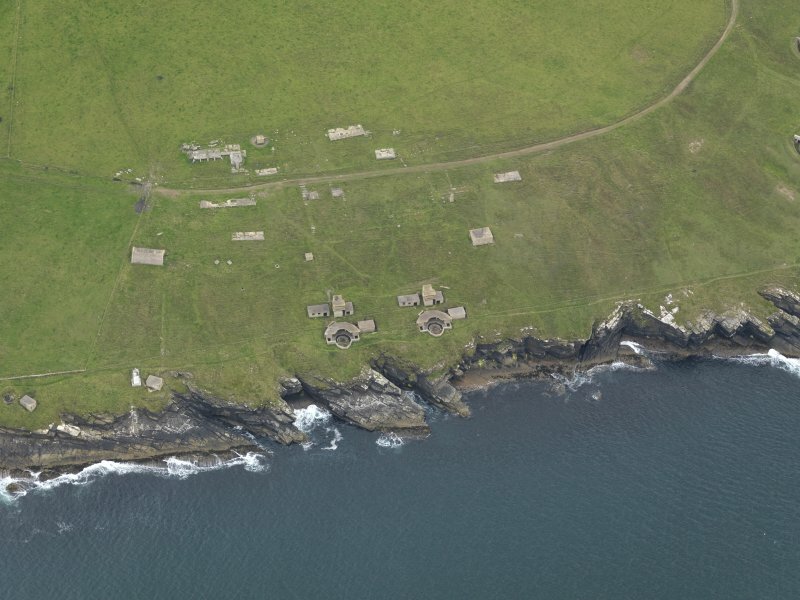 General oblique aerial view centred on the coastal gun batteries, taken from the ESE. 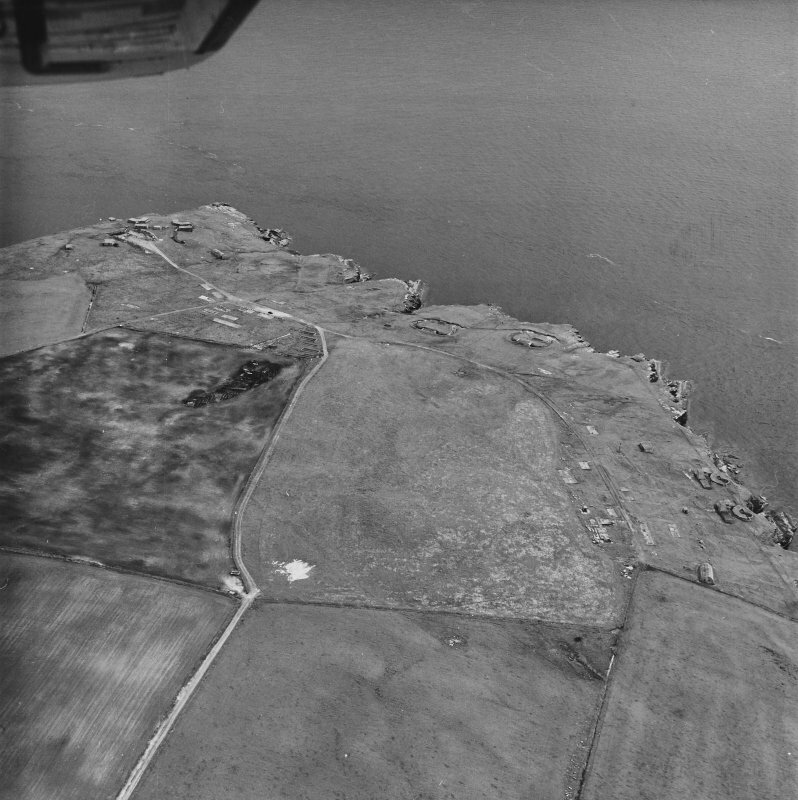 General oblique aerial view centred on the coastal gun batteries, taken from the WSW. 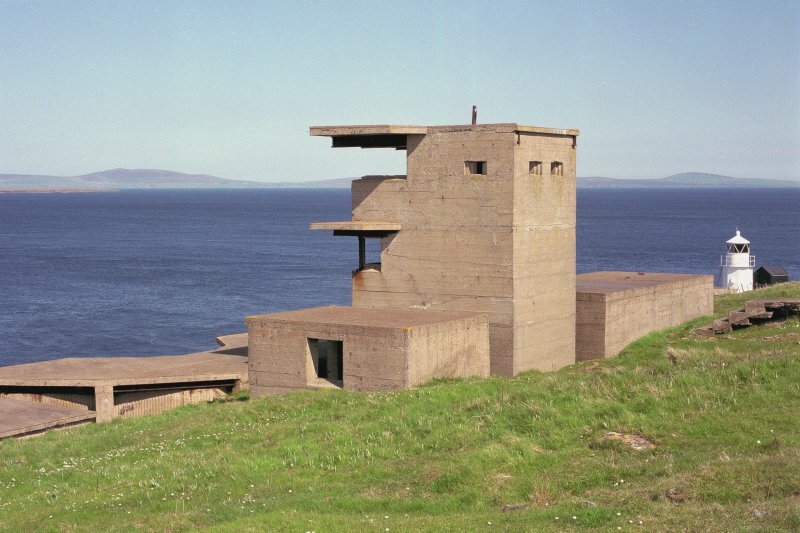 During the Second World War the Balfour Battery, which included gun and searchlight emplacements and observation towers, was constructed on Hoxa Head. It overlooked one of the main approaches to Scapa Flow, a major strategic base for the British Navy during both World Wars. Balfour Battery: A double 6 pounder battery with magazine, shelters, observation tower, engine room and searchlight platforms. 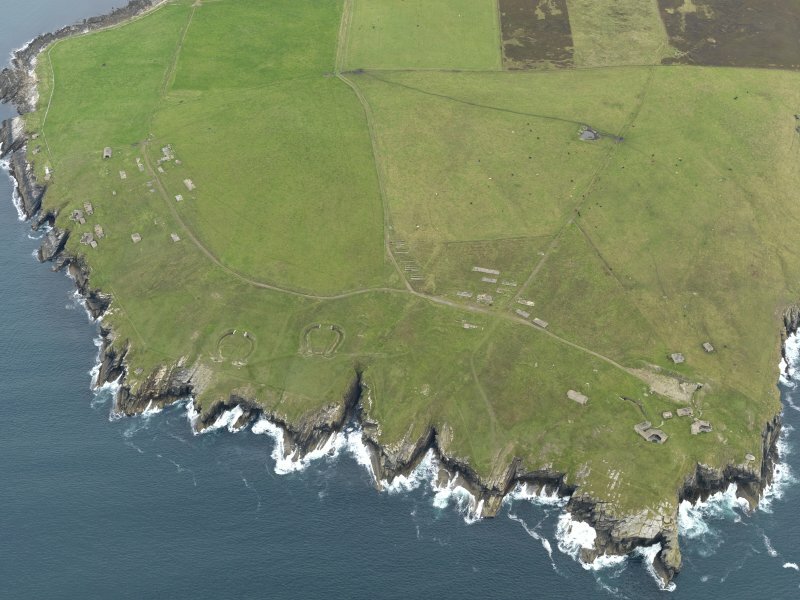 In 1941, the 12 pounders that were installed in 1940 were removed, one to Carness Battery (HY41SE 51) and the other to Cara Battery (ND49SE 28). J Guy 1993; NMRS MS 810/2; WO/192/263 PRO. ND 403 931 Balfour and Hoxa Batteries, WWI and II remains: searchlight emplacements, lighthouse base, gun batteries and associated buildings and earthworks. 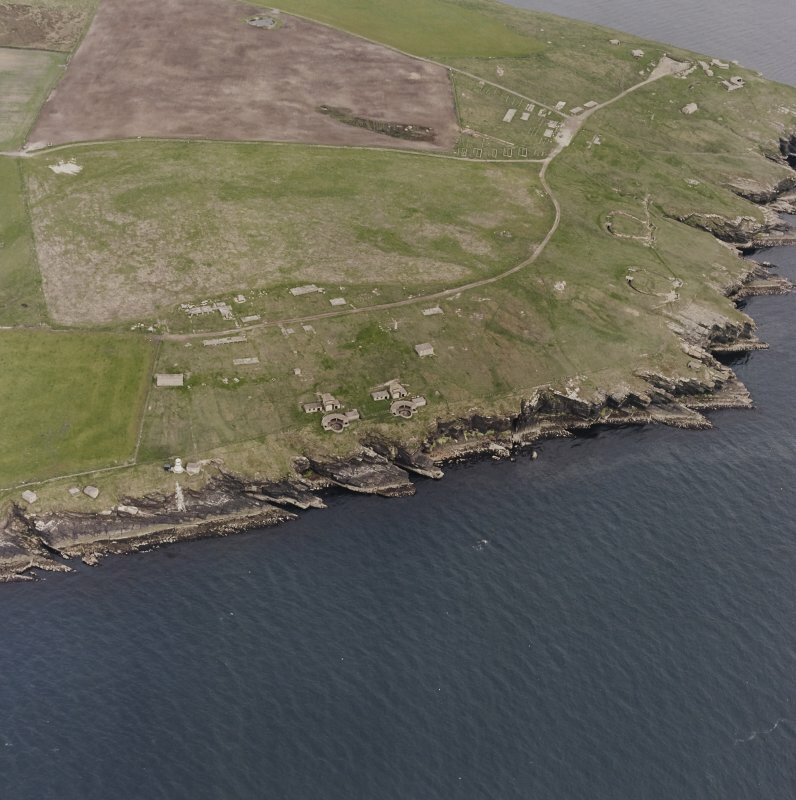 A large coast battery is situated on clifftops at the northern part of Hoxa Head overlooking the Sound of Hoxa, the main southern marine approach to Scapa Flow. 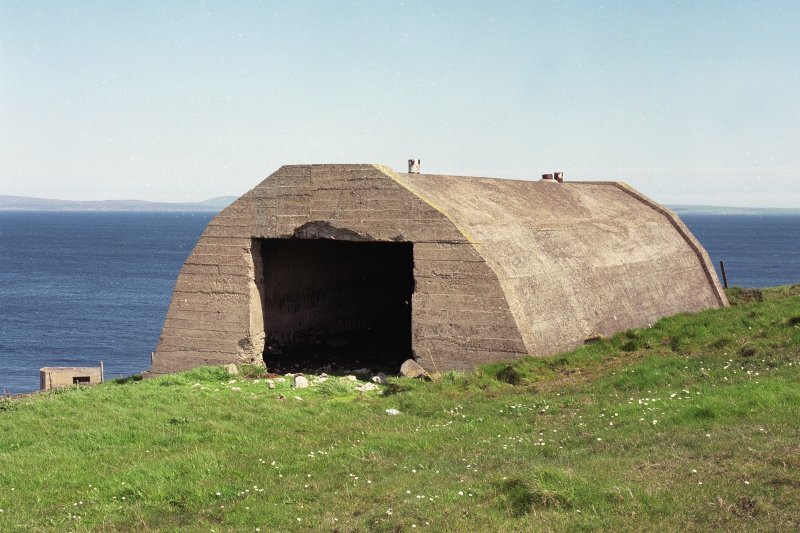 The battery consists of two gun emplacements with two storey observation towers about 7m to the rear, a magazine, engine room and 70m E upslope, the remains of the accommodation camp. All the standing buildings are of reinforced shuttered concrete and steel beams or stone and concrete. The gun-emplacements are cut into the slope which has been revetted at the rear with stone and both have small magazines on the S side. Three searchlight emplacements are ranged along the top of the cliff from the light beacon (ND49SW 25) to a point about 70m to the NE. All that remains of the accommodation camp are at least ten concrete hut bases, two of which has been artificially raised on concrete supports. About 80m NE of the northern gun-emplacement is a stone and concrete engine room and 42m SE of the southern emplacement is the main magazine. The coast battery was armed with two 12-pounder guns in April 1940, then re-armed with twin 6-pounder guns and the 12-pounders removed. Designated by the War Office 137 Battery and manned by 533 regiment (PRO WO 199/2627). Visited by RCAHMS (DE, GS, SW), August 1997. 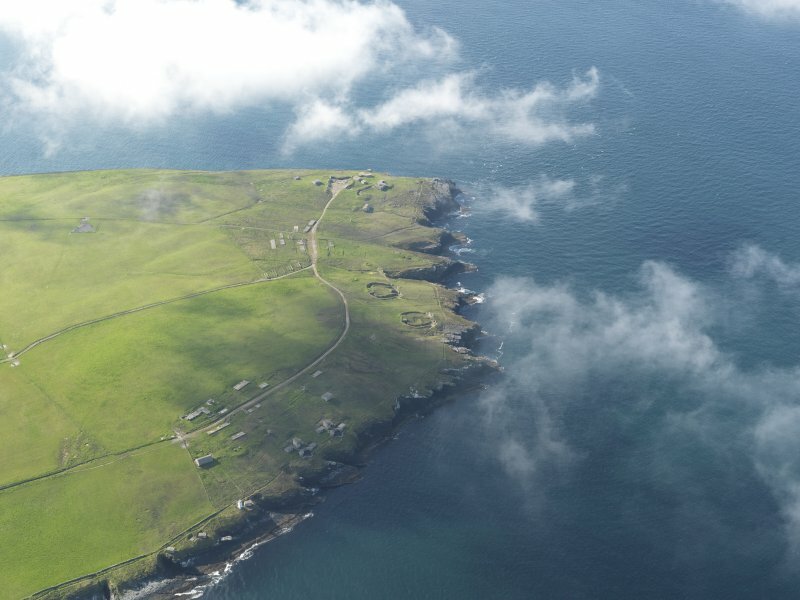 Hoxa Head overlooks the main entrance into Scapa Flow through Hoxa Sound. Hoxa Battery was built in the First World War at the southern tip of the peninsula and equipped with 6-inch gun emplacements and magazines. In the Second World War it was rebuilt with two 6-inch gun emplacements and magazines, an observation post, an engine-room and footings for searchlights. These defences were strengthened in 1940-1 by the addition of another battery to the north, alongside the lighthouse built in 1901. This is the Balfour Battery, which is now the better preserved of the two. There are two twin 6-pounder gun emplacements with their ammunition magazines and shelters, an observation tower, three searchlight emplacements and an engine-room. 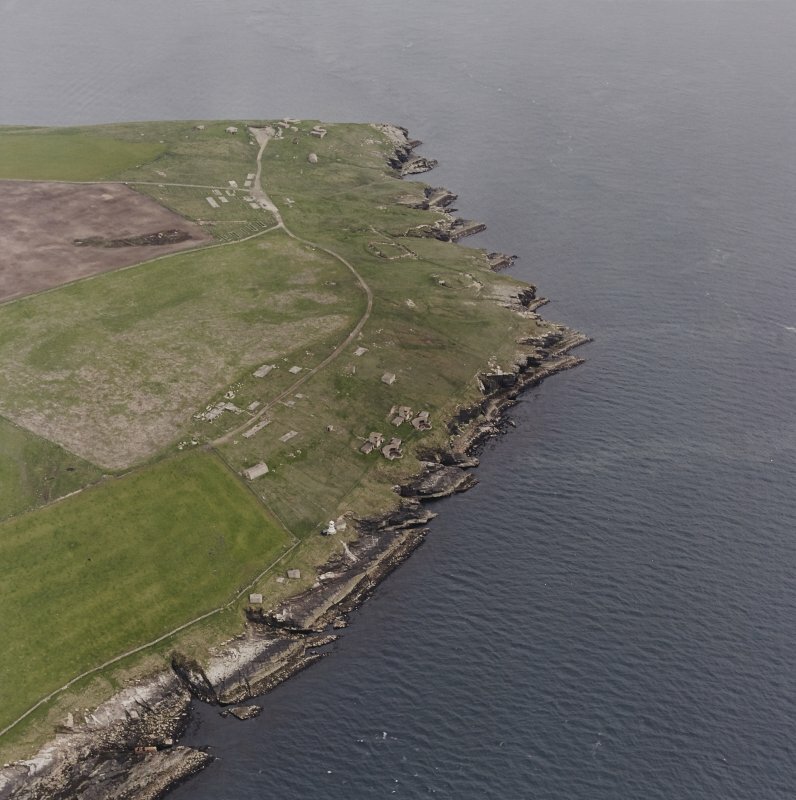 Hoxa Head is strategically located for monitoring access into Scapa Flow through Hoxa Sound and Coastal Batteries were operational here during both world wars. Hoxa Battery became operational in 1915. It was equipped with four 4'' Quick Fire guns. 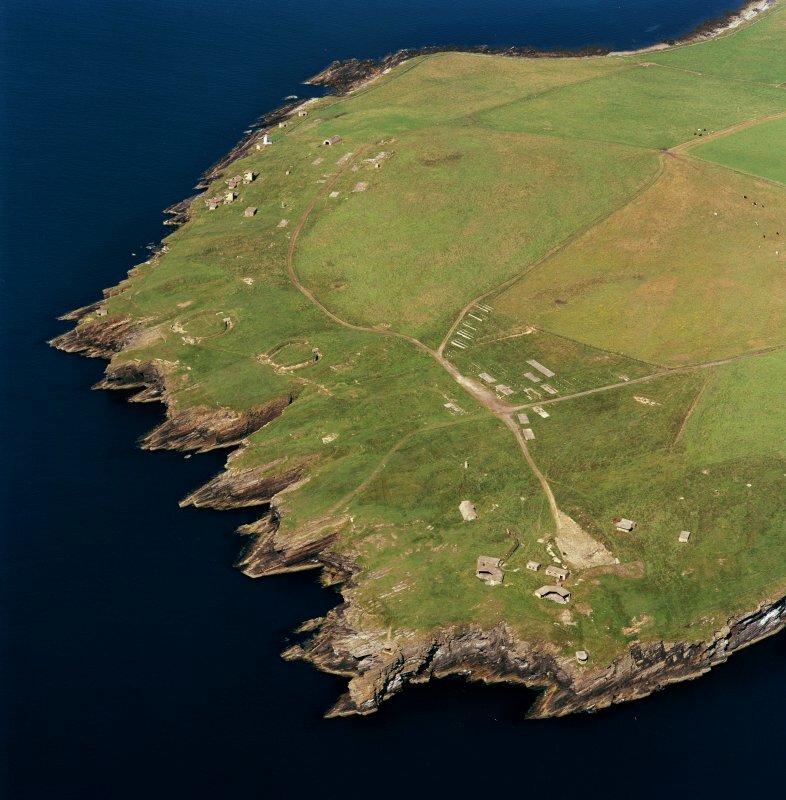 Located on the east-facing coast of the headland, it operated in conjunction with Stanger Battery on Flotta to defend Hoxa Sound. A second battery was built in 1916; this faced S to cover the entrance to Switha Sound and was armed with two 6'' Quick Fire guns. Hoxa Battery was re-established in 1939 with the emplacement of two 6'' Breech Loading guns and the construction of a range of ancillary buildings including an extensive camp. The new battery was located on the south coast of the headland and was charged with guarding access to Hoxa Sound and remained in use until 1943. Balfour Battery was brought into being in 1940 to defend Hoxa boom. Initially, two twelve-pounder guns were temporarily emplaced c.300m to the N of Hoxa Battery. By 1941 two twin six-pounder guns were permanently installed The battery remained in use until 1945. The lists below represents the most significant elements associated with the batteries which lie within 50m of the coast. They are described as they occur moving from north to south. 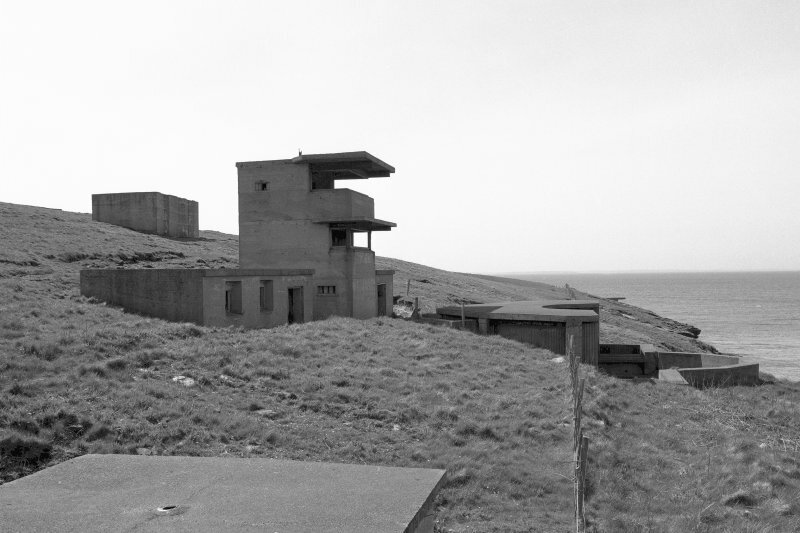 (i) Two concrete searchlight emplacements, lying 15m apart, are located 2m from the cliff edge. Access is via a set of steps leading down to a single doorway in the S side. The front of the structure has three slit openings, producing a dispersed beam when operational. They measure 5m by 3.5m and stand to 2.5m high. They both retain some internal fixtures and wall paint. (ii) A searchlight emplacement, similar to (i) is located 5m from the coast edge, adjacent to a modern lighthouse. A wooden door has been added and the windows have been blocked up; it is currently in use as a store. (iii) The northernmost of the twin six-pounder gun emplacements is located on the edge of a steeply sloping cliff. The gun was housed to the centre of the concrete structure, with a covered walkway and a range of stores surrounding it. A directing tower, several shelters and a magazine building are located to the rear. It was noted that exposed iron beams are now very corroded and parts of this structure may be structurally unsound. (iv) The second, southern battery, is similar in all respects to (iv) above. (v) A horseshoe-shaped earthen bank, built against a natural slope lies 25m from the cliff edge. It measures 9m by 5m and stands up to 1m high. (vi) A concrete plinth, measuring 3.2m by 1.5m, lies 25m from the cliff edge. (vii) A linear earthen bank extends for 5m and is up to 1.5m wide. It is located 20m from the cliff edge. (viii) A searchlight emplacement, located on the cliff edge, is entered via a door in the S wall. The front of the structure is badly damaged and is now completely open. It measures 5m by 3.5m and stands to 2.5m high. (ix) The northernmost of two WWI 4'' gun emplacements is located within 10m of the cliff edge. The front of the complex comprises two concrete barriers set c.10m apart, behind which the guns would have been set. Each gun position is linked, via a semi-subterranean passage, to a magazine building at the rear. (x) The second WWI gun emplacement is located 30m S of (x) and is identical in form. (xi) A rectangular pit, measuring 13m by 8m, is cut into the ground surface 10m from the cliff edge. Two narrow linear cuts lead off from either end. This hollow may have housed a storage tank with attached pipelines or drains. (xii) A rectangular depression may represent the remains of a semi-subterranean structure. It measures 13m by 7m, is located 20m from the coast edge. Collapsed stonework to the N side of the depression apparently derives from a hearth and chimney. (xiii) The remnants of a structure, which comprise a concrete floor and fragmentary drystone walls, are located 10m from the cliff edge. The floor covers a 36m2 area and there are indications of an entrance to the N side. 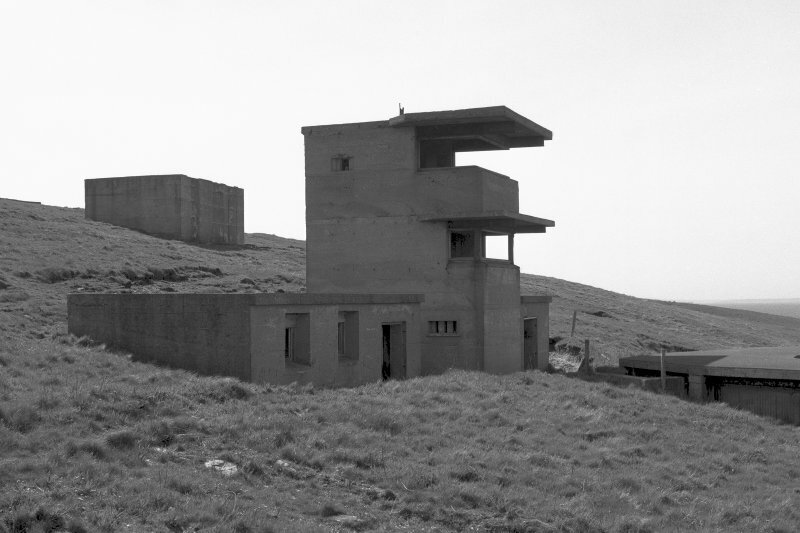 (xiv) A searchlight emplacement lies 2m from the cliff edge. It measures 5m by 3m and stands to 3m high. The front has a single large opening with 1800 field of vision. (xv) The WWI 6'' gun emplacements have been disturbed and obscured by the WWII structures. Fragments are still visible, located within 20m of the cliff edge. (xvi) Two concrete WWII gun emplacements, which housed 6'' Breech Loading guns, are located 50m from the coast edge. 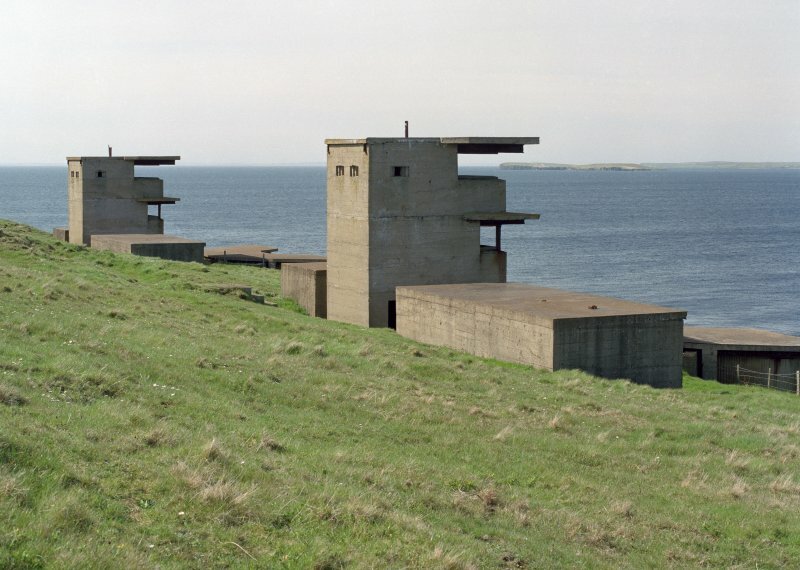 They are surrounded by a range of buildings which include two magazines, two shelters, and the battery observation post. A track leads downhill from the gun emplacements to the camp area. (xvii) A searchlight emplacement, similar to (xv), is situated to the SW of the gun emplacement (xvii). (xviii) An artificial rectangular hollow in the cliff side may have housed storage tanks or a semi-subterranean structure. The cut, which extends into bedrock, measures 20m by 6m and is up to 2m deep in places. A small concrete plinth is located towards the centre of the area.